Limited License and Copyright. This Site, including all Materials, is protected by Canadian and worldwide copyright laws and treaty provisions. You agree to comply with all copyright laws worldwide in your use of this Site and to prevent any unauthorized copying of the Materials. We are committed to respecting your privacy. 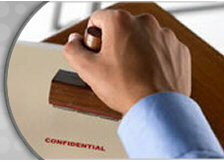 When you contact us through our website we will consider your contact information private and confidential. We collect your information to provide you with the best possible service. We will not e-mail you for marketing purposes in the future unless you have given us your consent. We will not distribute your personal information to any third party marketing companies. Certain links on this Site may take you to other web sites. Our company provides these links only as a convenience. These linked sites are not necessarily under the control of our company. If you use these sites, you will leave this Site. If you decide to visit any linked site, you do so at your own risk and it is your responsibility to take all protective measures to guard against viruses and other destructive elements. Docu-Shred is not responsible for the contents of any such linked page or any other page not under its control. Docu-Shred makes no representation or warranty regarding, and does not endorse, any linked web sites, the information appearing thereon or any of the products or services described. Links do not imply that our company sponsors, endorses, is affiliated or associated with, or is legally authorized to use any trademark, trade name, logo or copyright symbol displayed in or accessible through the links, or that any linked site is authorized to use any trademark, trade name, logo or copyright symbol of Docu-Shred.